Verson hydroforming presses use fluid pressure instead of the punch in a conventional press to form the part into the shape of the die. This type of press is a cost-effective way to produce a single lightweight, structurally stiff and strong component that normally would be made from multiple pieces and stampings and welded together. An aluminum tube or “pillow” is placed inside a negative mold and high-pressure hydraulic pistons pressurize the inside of the aluminum to thousands of PSI, which causes it to expand until it matches the mold. This eliminates costly sub-assembly of multiple pieces and reduces weight by eliminating the flanges required for welding and allowing use of thinner material. 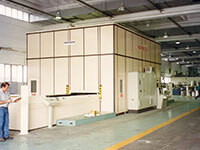 Stiffness is maintained, however, because disjointed pieces and welds are eliminated. Verson hydroform machines are recognized by the lighting, prototyping and aerospace industries for their ability draw low volume parts without expensive tooling. Verson hydroforming presses form complex parts with fewer operations than conventional blanking, stamping, welding and machining processes. 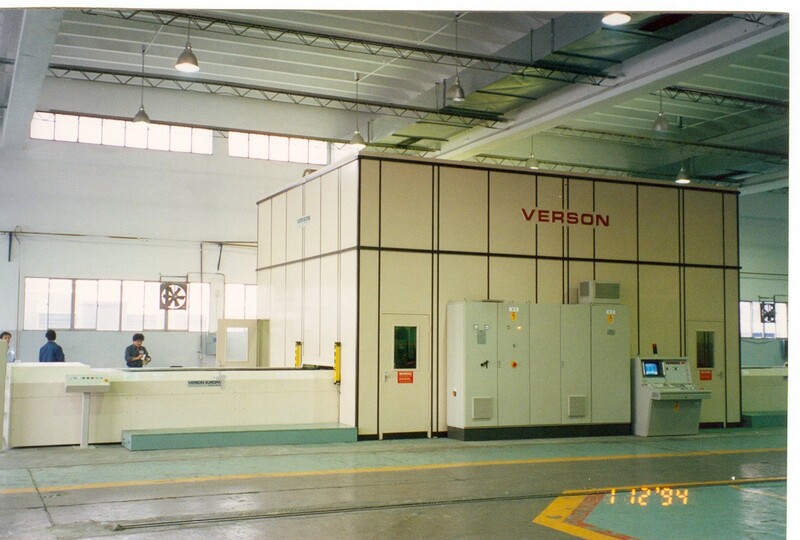 Verson developed Wheelon hydraulic fluid cell presses to meet the specific needs of the aircraft and aerospace industry, which needed to form complex parts in one operation that formerly required staged drop hammer or costly conventional press work. These presses use an inflatable bladder, or fluid cell, to shape metal parts. Wheelon presses form pre-cut blanks of aluminum, stainless steel or aircraft steels over multiple, complex-shaped die blocks. These tooling-form blocks are placed in a loading tray and sheet metal blanks are placed over the blocks. Throw pads are next placed over the blanks to cushion sharp edges. The tray is then fed into the pressing chamber. There, a flexible fluid cell is inflated with high pressure hydraulic fluid. The fluid cell expands and flows downward over and around the metal blank. The cell follows the contour of the die block, exerting an even, positive pressure at all contact points. As a result, the metal blank is literally wrapped to the exact shape of the die block. The press is then depressurized for loading the next tray. This process gives you the ability to form parts from aluminum, titanium, stainless steel, and other aerospace alloys in low volumes — often not requiring hand finishing — without expensive tooling. Contact us for prompt shipment of replacement OEM parts, including fluid bladders, to keep your Verson Wheelon hydraulic fluid cell press running and productive.